The L. Ron Hubbard East Coast theatre performing Mr. Hubbard's military-based western story, “Come and Get it” at the Scientology Information Center on Feb. 16th in Downtown Clearwater. The theatre's next performance will be on April 13th. 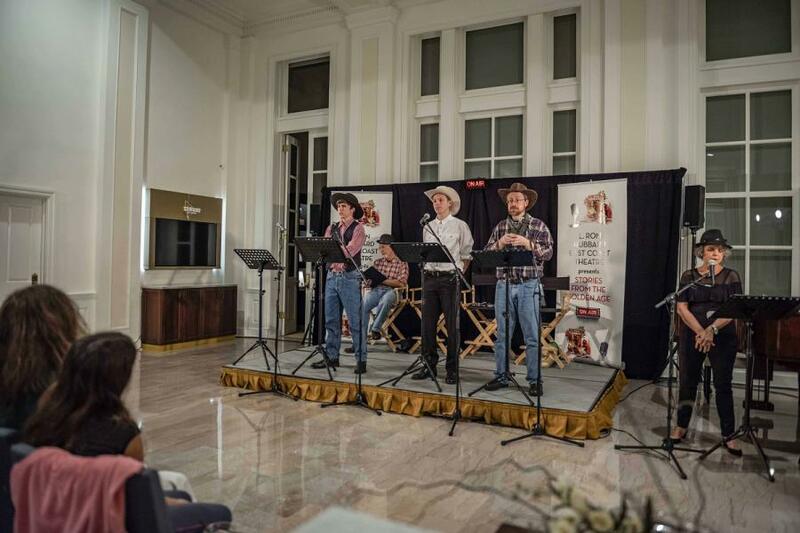 CLEARWATER, FLORIDA, US, March 6, 2019 /EINPresswire.com/ -- On Saturday February 16th the L. Ron Hubbard East Coast Theatre performed, “Come and Get it” a Western story written by Mr. Hubbard at the Scientology Information Center, 500 Cleveland Street in Downtown Clearwater. Guests in attendance were intrigued by the live theatre reading, replete with gunslingers, sound effects and non-stop action. A pre-performance set of music reminiscent of the 1930s and ‘40s was performed by Ms. Joanie Sigal, the show’s producer, helping to bring the era to life. Come and Get it is about a military-trained young city slicker, who inherits a Wyoming spread after his father’s mysterious death. In search of the culprit, he discovers that the only way to get justice is to cook up a new identity for himself, not revealing who he really is. Mr. Hubbard had a professional military background, having served as a First Sergeant in the 20th Marine, 2nd Battalion in 1930 and as a Naval Lieutenant during World War II. With that in mind, his 1938 story, “Come and Get It,” was an example of one of the many stories he wrote reflecting values exhibited by military service men, including “honor,” “integrity,” and “persistence” – the very same qualities Mr. Hubbard strove to uphold in his own life. Guests loved the lively and expressive acting and shared their thanks with the cast afterwards. The East Coast Theatre's next performance at the Information Center will be a mystery/suspense story called, "Calling Squad Cars" on Saturday, April 13th at 6:30pm. The Scientology Information Center is open daily from 10 am to 10 pm. For more information about the troupe’s next performance at the Information Center, please contact Amber Skjelset at (727) 467-6966 or email amber@cos.flag.org.